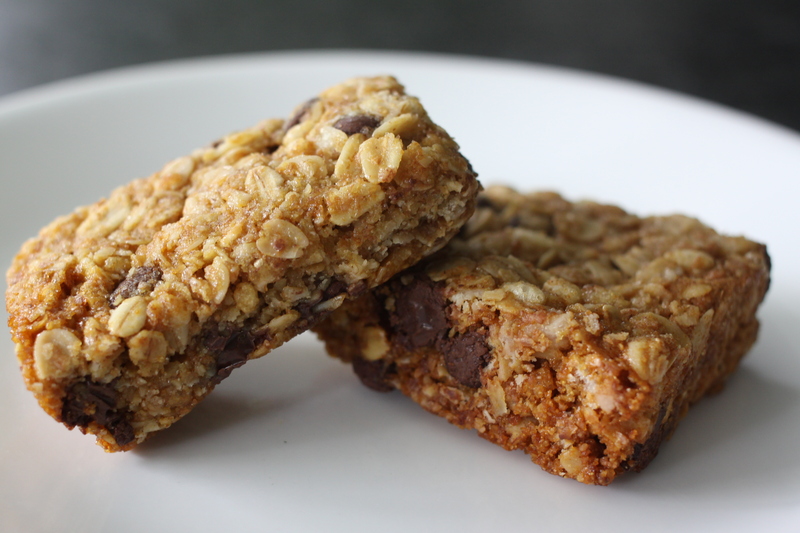 Granola bars are a most versatile snack. They’re tasty at any time of day, and you can easily switch up the ingredients depending on your mood and what you’ve got in the house. This is our standby recipe. We individually wrap the bars so they’re ready to go when we are. Combine oats, cereal, flour, baking soda, salt, flax seed, and sugar. Melt butter and combine with vanilla. Add butter/vanilla to oat mixture and stir to coat. Add 2/3 cup of honey and stir well.You will probably have some dry parts that won’t combine well with the other ingredients. If you do, add more honey, up to 1/3 of a cup, until everything’s sticking together pretty well. It should be pasty, not soupy. Butter a 9″x13″ baking pan and press the mixture into it firmly using the back of a spatula. Let cool and then cut into bars. We cut them in thirds the long way and then into the desired width. These will last at least a couple of weeks in plastic wrap, but you’ll likely eat them sooner. Are they soft and chewy or crunchy? Thank you. They look great. Bookmarked this one. Yum! Will add this to my recipes to try! I’ve been looking for a granola recipe for a while now! Thanks for sharing!